I started with a base of Purple Orchid, then sponged on a gradient using Grape Gumdrop. I added polka dots using a small dotting tool and Harp On It (polka dots still aren't my strong point, they look so easy to do but mine are never perfect! How do people do it!?) my accent nail is Harp On It with Grape Gumdrop polka dots. Harp On It is from Color Club's amazing Halo Hues collection and is probably my favourite holo ever....it gives me googly eyes. 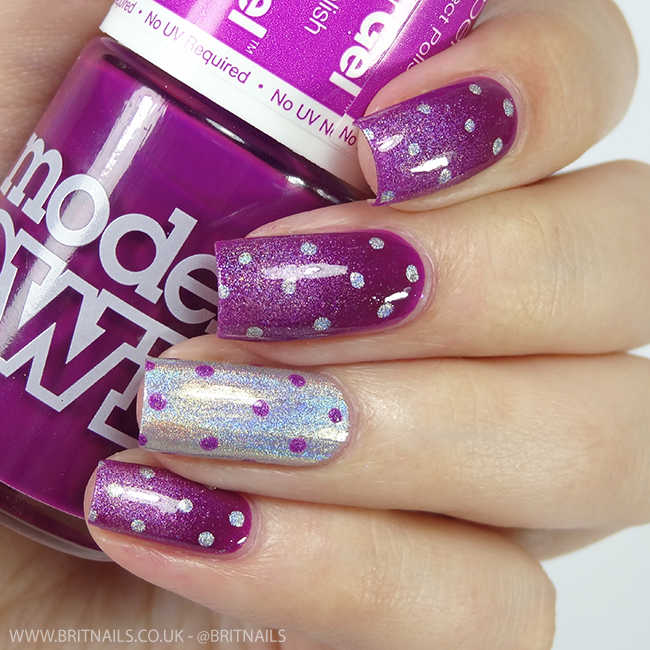 Such a perfect look, love the dots and gradient! I'm obsessed with that purple holo gradient!! So gorgeous! I'm never happy with my polka dots either! I think these look great though, I like that they're spread out enough to enjoy that stunning gradient! Stunning! That Color Club is amazing hey! I really like that you kept the dots nice and small so I can see all the rainbows! The gradient looks amazing too! Stoooppp! Absolutely gorgeous! Love the holo and the polka dots.